The vehicles, which were shipped to the Middle East in two tranches during the mid-2000s, have individually clocked between 56,204 and 60,208 hours and continue to remain in extremely good condition. The trucks have been maintained by the client’s own trained engineers and, owing to the high sulphur content in the fuel being used, have been serviced every 250 hours. 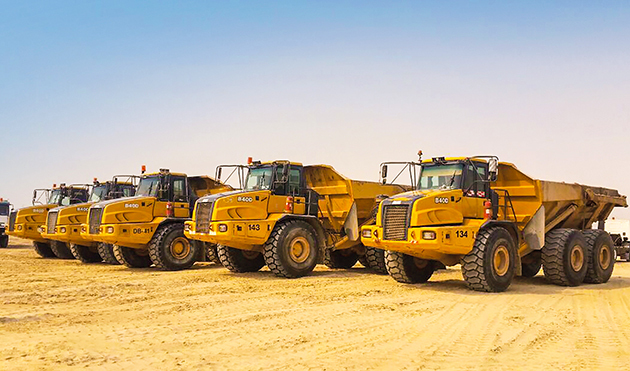 Bell Equipment has supplied all the necessary replacement parts and oils required and made regular visits to the Kuwait site during the 11-year project to-date, offering advice and recommending preventative maintenance actions. Whilst weather conditions differ in the UK, where rain and mud put machines through their paces in comparison, Nick goes on to say that similar levels of commitment to service and maintenance can significantly increase the functioning life of Bell vehicles here too. “For the UK market, we recommend that operators service machines every 500 hours. It’s a process we support every step of the way. We can arrange for our qualified engineers to perform all necessary maintenance and servicing, or alternatively supply customers with service kits for their own engineers to use at each recommended stage. The kits contain all the oils and filters required to complete a service at each suggested interval, from 500 hours onwards. “With the right technical advice and commitment to maintenance there’s every opportunity for any UK Bell machine to achieve its own impressive working hour milestone.